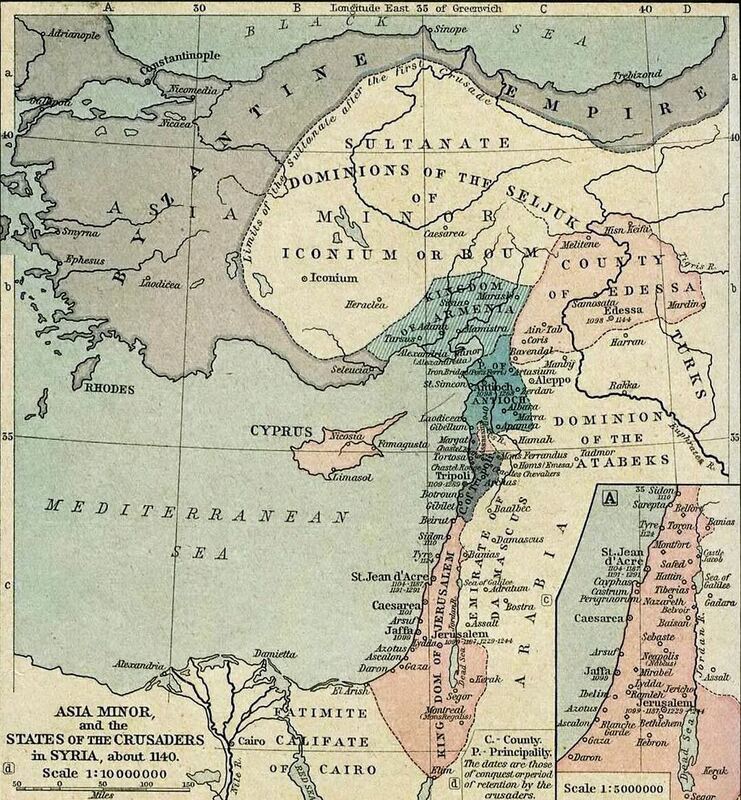 The Crusader states, also known as Outremer, were a number of mostly 12th- and 13th-century feudal Christian states created by Western European crusaders in Asia Minor, Greece and the Holy Land, and during the Northern Crusades in the eastern Baltic area. The name also refers to other territorial gains (often small and short-lived) made by medieval Christendom against Muslim and pagan adversaries. The Crusader states in the Levant were the Kingdom of Jerusalem, the Principality of Antioch, the County of Tripoli and the County of Edessa. The people of the Crusader states were generally referred to as "Latins". During the Third Crusade, the Crusaders founded the Kingdom of Cyprus. The coins minted in Jerusalem during the 12th century show patriarchal crosses with various modifications. Coins minted under Henry I show a cross with four dots in the four quarters, but the Jerusalem cross proper appears only on a coin minted under John II. The crescent in pellet symbol is used in Crusader coins of the 12th century, and many Crusader seals and coins show a crescent and a star or blazing Sun on either side of the ruler's head or as the obverse motif. Obverse: Cross pattée in a solid ring with inscription around it. Solid ring on the rim. Reverse: Lion of Cyprus facing left and in a ring. Inscription around it and another ring on the rim.